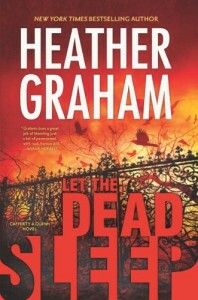 Let the Dead Sleep is the first in a new series by Heather Graham. The series looks to be quite different from the Krewe of Hunters series. In a way, it reminds me of that TV show from the 80's, "Friday the 13th". The one about the antique shop owners who have to get back cursed objects. Only, this one isn't cheesy. I enjoyed the cast of characters in the book. Danni and Quinn make a great team. I also loved their attraction for each other. Danni inherits her father's shop not knowing about his life's work. There also seems to be a hint that she may exhibit some latent psychic abilities. Quinn died once and upon coming back he seems to have gained some extraordinary abilities. It will be interesting to see how things between them develop. The story of the cursed bust was pretty good. There were a few twists that I didn't see coming. I looked at this book as a nice set up for the rest of the series. I look forward to more from Danni and Quinn.